He has done really well, finished this season as Bambino champion for all 3 seasons he raced in it. Senna, watch out... you cannot stop anyone when they get the bit between their teeth and looking for "bigger numbers..."
Yeah, well I'm still in Edmonton... exchanged some greetings with TopContender a few days ago. He's doing well in the business trade, it seems. As far as MotorSports go, I may have peaked. Last month, I did a club event at the electric arrive-and-drive "Speeders" here and surprised myself by winning it. Of course it jumped me up a class, and next event, although I qualified for the feature race, it was miserable and I finished fifth of five half a lap back. More practice, I guess. Oh, and (Economic) Anarchy in the DisUK! My grandson has just competed in the European Finals = Micro, mini and Junior Go-kart's held over the last 5 days in Austria. He was 8 in June and raced against kids up to 12 years of age. Ended up 19th out of an initial number of 41 entries (the final consisted of 34 karts). He started the final on grid 18 and as up to 16 in the 2nd lap, he then got pushed off and went to 26th before getting back to 20th then advanced 1 place when the person who pushed hi off got a 10 second penalty. To say the family is proud of him is an understatement. Harry finished the season in 5 place overall. 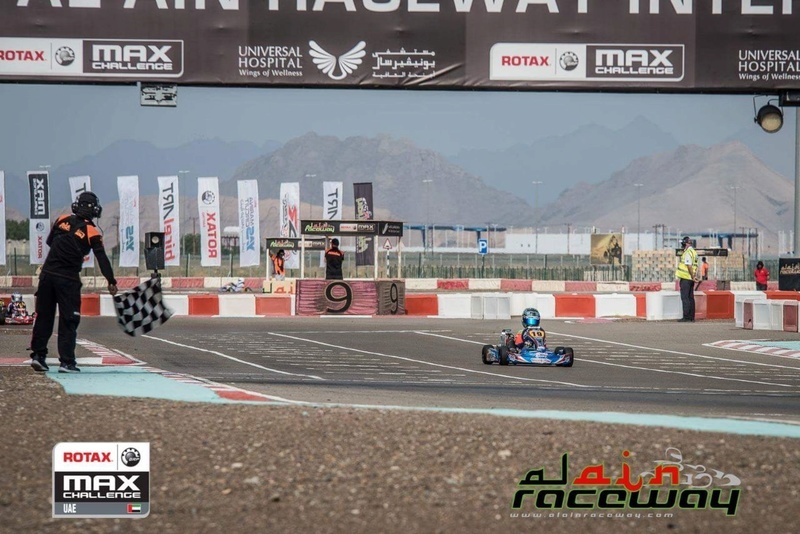 Very good for a 8 year old racing 12 year olds and under (the next youngest competitor is 10) he flipped his cart in early December and broke his arm, he was only out for 6 weeks. Hopefully he will get an invite to the European Kart Championships (in Portugal this year), otherwise, next season. I watch British Touring Cars (BTCC). I remember a young driver, racing in Formula BMW, doing rather well in the myriad of support races. His name was Lewis Hamilton. Wonder what ever happened to him...? I was watching the F4 Race, which was one of the support races at the BTCC Donnington Park meeting a couple of weeks ago. I have NEVER witnessed such an accident from a live on-board camera as I saw that day. I've been aware of Billy Monger over the past few years - as he rose through the ranks from Ginetta Juniors and onward. Any concerns for your Grand-Son, as a relative, DB? Really great stuff there! Very nice track. Would love to have a go there. The Al Ain race track... is that as in Al Ain Prost? LOL!!! Gelert wrote: I watch British Touring Cars (BTCC). I was with him at the Al Ain track when he crashed and broke his arm. His father had to work so I flew to Dubai from Bahrain and too Al Ain for the first day testing and set up. The next day his father joined us mid morning. Harry did the warm up and first 2 qualifying heats, and qualifies in 6th. He got a very fast start and was into 3rd off the grid, he then went second as they approached the first bend but got clipped on the back and spun, he was then t-boned by another car and went airborne and landed upside down (with no roll cage). i went running down to the corner (I was up on a observation deck a hundred meters behind the start grid) hoping that he had not injured his spine, when I got there the medical people already had him with a neck-brace on and were putting pins (or something) in his leg and asking if he could feel anything. He was sobbing and said it was his arm that hurt. It took about 20 minutes to get the all clear to lift him into the ambulance (although I had seen him move his good arm so felt reassured that there was no spinal injury) and take him to the hospital. By the time I got to the hospital (after getting the paperwork signed and handing the car over for inspection) it was about 2 hours later and by that time he was strapped up and ready to leave. Not a nice experience, and you are worried sick initially until there is some sign that it is not critical. Funny aftermath; Harry told his dad (in the ambulance) that his arm hurt a lot and he did not want to race again. By the time he was strapped up (and flying/drugged-up with pain-killers) he was asking the doctor how long before he could drive again. when we got to the Hotel and settled down in the room Harry said he was hungry and could we go to the bar (where we normally eat in the evening when we go there) and get him a burger. We said are you coming and he said no he wanted to stay and play on Granddad's computer. His father left him his phone with my number already there and said to ring if there was any problem. we got to the bar and ordered food (and a couple of beers). We ordered a second beer while we were waiting for the food then after about 20 minutes my phone rang and it was Harry saying "is my food ready and can we come back soon, you can bring your beer with you. Things were back to normal. 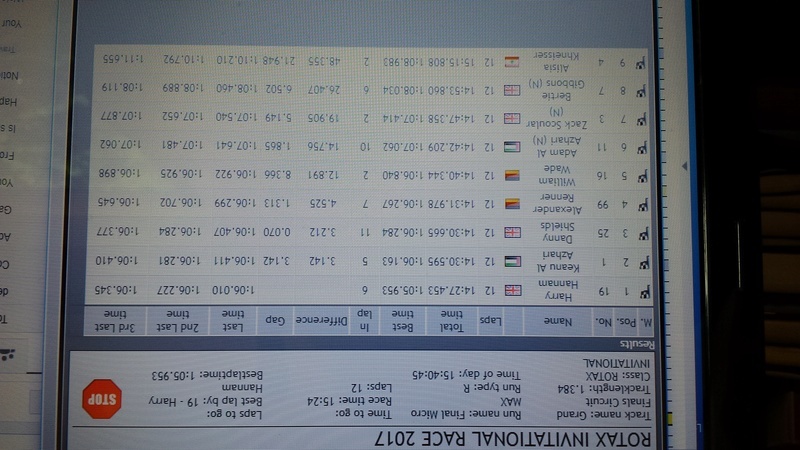 Henrik, Harry hold the lap record on the F1 configuration for his Kart class at that track (all cars have to race at a minimum weight so his age and being smaller than most competitors is not an advantage). We had the same weight thing, with the minimum weight being set with the driver in the kart. I did spend time training to get my weight below the minimum though, as it then allowed me to decide where I wanted to add the ballast. It doesn't make a huge difference for sure, but every little bit counts. By the way, I hope to make it to Bahrain one of these days as my employer has bought a bank that has a branch there. As they may want to add some focus to this market, I have let my boss know that I would be interested in participating one way or another. With my past experience and knowledge of that part of the world it may interest him. After a year as a 8 year old racing kids 9, 10, 11 & 12, Harry is a year older and back to inning ways. It was an impressive performance as he led every lap and increased his lead on each successive lap. Monaco Private Box still within reach for the lucky Shamu few. Sorry it is upside down, but out Aussie readers will be happy (and if you open the pic in a new Tab, it is the right way up, go-figure?). If you want to win, don't just win, take the piss. Just wow!!! He is truly something else. Henrik wrote: Just wow!!! He is truly something else. If you are ever near Dubai you know you will be welcomed by Dan (he owes you for the BQ in Singapore ). If you want to celebrate a special occasion I recommend a long weekend at the "Viceroy", Yas Marina, Abu Dhabi, there is a race there on Friday March 8, 2018. We also hope to be at the European Championships next year, not sure where it is being held yet. I will post Harry's interview after that last race on the "Secret Paddock Club" page. Anyway, next week we are off to Jerez for the superbike race. Harry has just arrived in Brasil for the Rotax World Championship after a 15 hour flight from Dubai to San Paulo, 5 1/2 hour wait for his 3 1/2 hour flight to Conde Parabia. Outstanding! Keep me updated on how he does. Hi, you can get most information from these links, including live streaming of the races. Great! I will keep an eye on this then. I am still trying to find the times for the Micro Max races. Hi Henrik, 3 Non Qualifying practice sessions today and tomorrow. First Qualifying is on Wed 28th at 13:00 GMT. 8th out of 37 drivers: 0.5 seconds off the fastest time (with no drag/tow). Bit of an issue with live timing at the moment. but happy with his timing, especially as he is one of the youngest in the class. Started the second session at the back of the grid to try passing (only 8 laps) ended up with the 11th fastest time. 3rd session about to start. So that is 11th fastest time out of 37, after starting at the back? Basically getting 11th fastest time while having to pass other karts pretty much all the time! That certainly does sound promising!! Henrik wrote: So that is 11th fastest time out of 37, after starting at the back? Basically getting 11th fastest time while having to pass other karts pretty much all the time! That certainly does sound promising!! If you download the above link to your phone it will give you live timing (click on live timing) you can also select your racing type (Karting) and Country (Brasil). 3rd session yesterday was in heavy rain, first session today he had a puncture.